You know the look. The one your mom gave you when you said something out of line or broke a promise. The one I’ve finely honed on my own daughter now, as she breaks the same rules I once bent to my will. Mothers know how to speak without using a single word. They know how to pin our conscious to the board, like a butterfly skewered with a stick pin. 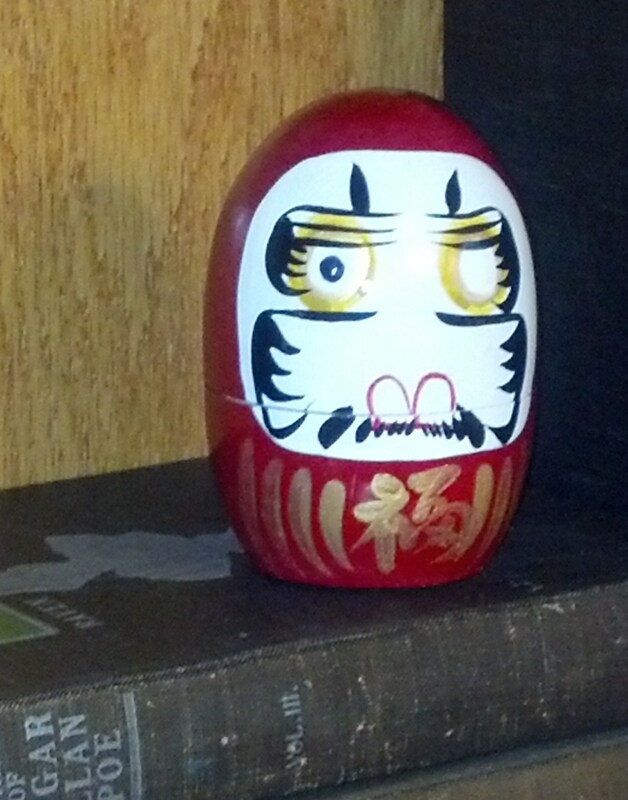 A daruma doll is a good luck charm from Japan, which incorporates a convicting singular gaze. Upon receiving an empty daruma doll, you are supposed to write a goal on a piece of paper and tuck it inside the doll. Then you fill in one eye with a pen or paint. This is the eye which watches you. The eye witnesses your noble attempts and your pointless hours of procrastinations. It sees your trials, tribulations, and triumphs. It knows your desperate heart and your self-sabotaging fears. The doll stares, expectation in its one eye. You have made a promise by bequeathing it one pupil. It awaits the other. And only you can fulfill the promise you’ve made to yourself. When (and if) you complete your task, the daruma doll gets its second pupil. And in this case, two eyes are less judgmental than one. The two eyes look to the future, toward a new goal. The daruma doll no longer looks to you for its completion and purpose. Seven times down, eight times up. A common phrase which often accompanies the daruma doll is Nanakorobi Yaoki, which means seven times down, eight times up. Since the daruma doll is rounded and weighted, it always rights itself. Another life lesson can be found in that simple concept as well. What goal would you place in a daruma doll? Would you feel motivated to complete your project? Are you up or down right now? What encourages you to get back up?